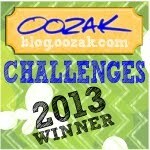 Today I got to be a guest designer on the Oozak Challenge Blog!!! My card was featured on the Anything Goes- Your Favorite Colors Challenge for Mixed Media. This is such a thrill for me and I can’t thank the great Oozak team enough for allowing me this great opportunity to showcase my work. Thank You Oozak!! !